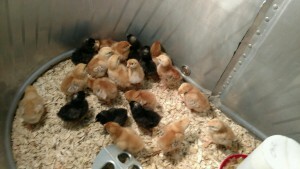 Baby chicks & guineas are here at J&N Feed and Seed. Baby Chicks and Guineas are available at J&N Feed & Seed. The baby chicks are mixed breed, pullets and sell for $2.50 each. While you’re picking out your chicks, J&N Feed and Seed has everything you need to raise a happy flock! See us for all your poultry supplies: feed, heaters, feeders, waterers, bedding, fencing and more. Start your chicks off right with our new Purina Organic Chicken Feed. Raising an organic flock has never been easier. To learn more about Purina Organic Chicken Feed click here. This entry was posted on Friday, March 11th, 2016 at 10:09 am	and is filed under Chicks, News & Updates. You can follow any responses to this entry through the RSS 2.0 feed. Both comments and pings are currently closed.